Post debate the words between the two candidates on the case were even harsher. There were some testy moments Monday night as Toni Preckwinkle mounted a new attack on Lori Lightfoot. They came as a new poll showed Lightfoot with a substantial lead with a week to go before Election Day. The latest poll, from WTTW and Crain's Chicago Business, gives Lightfoot a 35 point lead. 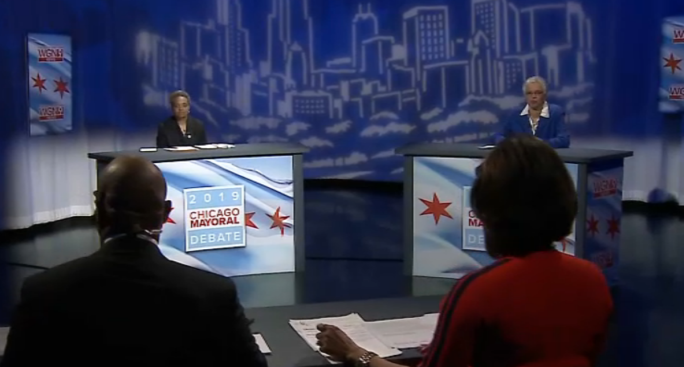 Preckwinkle acknowledged at the televised debate that her campaign “shopped” a story to reporters to expose what happened in the investigation of a fatal fire when Lightfoot worked at the Office of Emergency Management and Communications. During campaigns reporters are often given material, exposing opposition research the campaign has discovered on their opponent. In the case of this 2004 fire, four children were killed. Preckwinkle said “we’re all responsible for own conduct” and read remarks from a Cook County judge who ordered sanctions against the city for OEMC’s failure to preserve evidence. Post debate the words between the two candidates on the case were even harsher. Lightfoot called the criticism "desperation." "I think they’re attacking the fire department because they endorsed me, look this is a campaign that’s run out of money, isn’t up on TV and the only hope that they have is by generating buzz," she said. Preckwinkle responded by quoting the judge who said Lightfoot’s performance was “shockingly lax and cavalier and there was a reasonable argument that the city was deliberately hiding evidence from the plaintiffs." "During last night's debate Ms. Lightfoot clearly outlined her duties and responsibilities as it relates to this tragic occurrence," Bishop Larry Trotter said in a statement Tuesday. "She has shown compassion, remorse and has taken accountability in the matter," he continued, adding, that it was "unfortunate" that Preckwinkle would "exploit" the situation. That controversy unfolded as Rep. Bobby Rush doubled down on his claims that Lightfoot is pro-police and those who vote for her would have blood on their hands after the next police shooting. Preckwinkle repeatedly replied “Congressman Rush speaks for himself” and would not denounce what Lightfoot has called hateful rhetoric. Early voting is of course underway, so far though it is much slower than it was at this time four years ago. There are also 15 aldermanic runoffs as well. There are two more televised mayoral debates this week.